Thank you Mark, Josie and Stan — for your kind words and more importantly for your support and friendship. As I look out from here over all your faces, I am overwhelmed and full of gratitude. You constantly remind me that while evil exists it is far outweighed by the compassion and caring of special people. Throughout the painfully difficult last 16 months I have been comforted by the deep love of my immediate family including my husband Tim, my daughters Sarah and Rachel and their families which include my four precious grandchildren, and by so many friends, old and new, who have reached out and embraced me. I have also found solace and a sense of renewed purpose in my commitment to work on behalf of people who, like Aaron, have special needs and are therefore more vulnerable. This commitment led to the establishment of Aaron’s Fund and then on to my relationship with Imagine! as well as to the amazing bike project we have started with Community Cycles and the BVSD. Aaron had a kind and generous soul, he was passionate about his bikes and he wanted more than anything to live independently in spite of his disabilities. I feel like he is leading me in this work, that each new friend I make is a gift from him, and most of all I hope he is proud of me. This wonderful work has led us all to this special evening where we can once again commemorate Aaron’s life and affirm his legacy. We are going to share a short video with you that I hope will explain exactly why this dedication is so meaningful to me. Before we do that I want to acknowledge that, while you are all my partners in my own personal journey of mourning and remembrance, Aaron belonged to a larger family that includes three people who are not here with us tonight and whose journeys, though different from mine, are also sacred: Aaron’s father Jerry Tuneberg, his stepmother Jan Nerger and their son Jansson Tuneberg. We all loved Aaron and we will all always miss him. Now, please watch with me and I’ll speak to you again at the conclusion of the video. 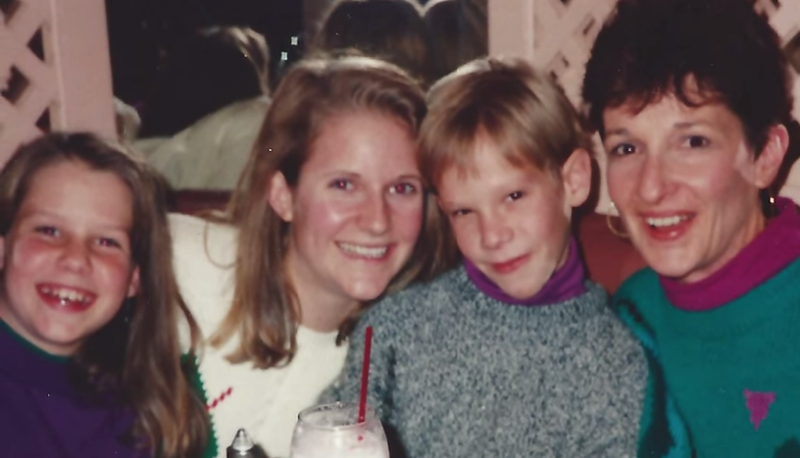 I was encouraged to make this video by an official in our state’s department of developmental disabilities because she felt that Aaron’s story was impactful and should be able to be retold over time without my having to do the telling. I hope that people who use this conference room in the future and ask why it is named for our Aaron, and those who see this video will be motivated to be even more mindful of and dedicated to meeting the needs of all the Aaron’s to come as well as the needs of their families. A friend who was helping me prepare for tonight suggested that I be more specific about what that mindfulness means to me so I will give a few examples, though this list in not comprehensive by any means. Many of you have generously donated to Aaron’s Fund. I celebrate your willingness to do so, and I hope you are as excited as I am about the projects in which we have invested and for which we continue to fund raise and to which we continue to contribute. I encourage everyone who is so inclined to find an organization that works on behalf of people with disabilities and whose mission resonates and support it in any and every way you are able, whether through financial donations or volunteer efforts. Pay attention to what is going on legislatively at both the state and national levels and lend your voice of support for funding services for all people with disabilities to prevent the kind of wait list that Aaron lingered on for 9 long years. If you are aware of a family with a special needs child or adult in your neighborhood don’t be afraid to befriend them and get to know what their life is like. Invite them to community activities but don’t be offended if they are not able to fully participate. Bring them a meal or offer to help with their typical children. If you are aware that they have some respite care that allows them to get out on their own, consider asking them to do something fun with you like a movie or dinner out, take the mom for a manicure or the dad to a sporting event. Ask them, honestly, what you can do to genuinely support and help them and listen to what they tell you. And most of all, when you see a situation in public where a family is dealing with a child or an adult who is acting in a way that is disturbing or uncomfortable for you, don’t assume, judge or shame that family because you may well have no idea what they are challenged by and they are almost certainly doing the best that they can. If each of you would go forward from this evening with just a bit more sensitivity towards and motivation to assist these special, amazing people like my beloved son, that would be the greatest honor you could give to me and, more importantly, to Aaron. It is now my pleasure to introduce Holli Berman, cantorial soloist from Congregation Har Ha Shem, who will conclude the program by leading us in a benediction. Aaron's Fund is dedicated to honoring the spirit of Aaron Tuneberg by helping adults with disabilities have safe and healthy lives full of joy and meaning.